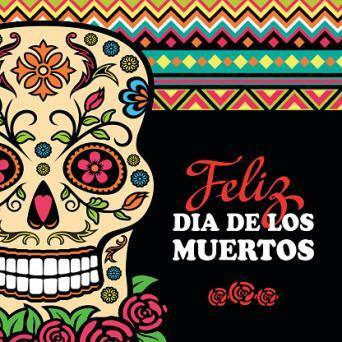 Day of the Dead, or Dia de los Muertes, is a festive celebration of the departed. 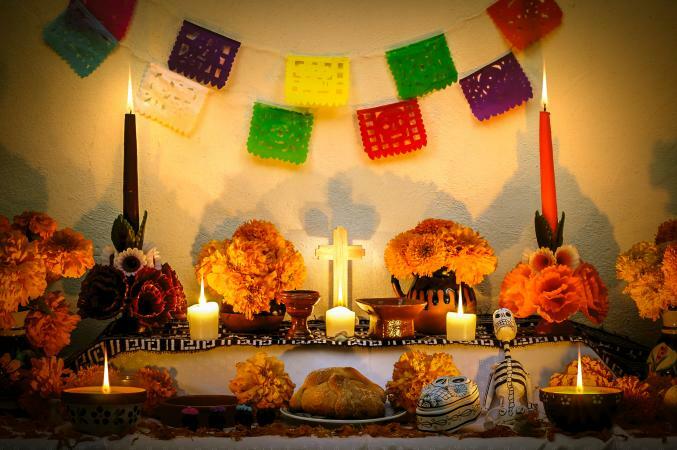 November 1 and 2 are set aside in many Latin America countries for a cheerfully ghoulish party. While skulls feature prominently, the festival is not gruesome but is a merry affair that seeks to remember and honor the departed. Design your own tombstone shaped invite with event particulars or purchase skull or skeleton cut outs. Young artists in the family can use scissors to create pull out skeletons embossed with the date, time, and essentials about the day. For hand delivered missives, turn tiny white pumpkins into Day of the Dead faces painted to show specifics of the fiesta. Since Halloween has just passed, many stores have clearance Halloween invites that do the trick and create that spooky, entertaining feel on a budget. Other Day of the Dead symbols which translate beautifully into invitations are Monarch butterflies and marigolds. While the macabre subject may seem scary for some youngsters, they respond well to the spontaneous joy and loving remembrance which reflects in Day of the Dead parties. Children's projects that center on the skull motif are popular and echo in decor, food, and games. No Day of the Dead celebration is complete without face painting. Vegetable derived paints are safe and non-toxic. Provide brushes and mirrors for young party goers to design their own design or have an artistic assistant on hand to help the littlest kids. 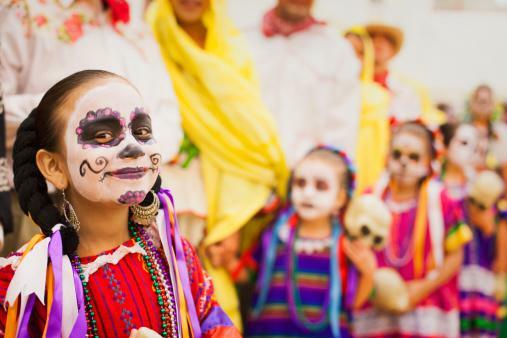 Painted faces representing La Catrina are commonly seen. Tissue blooms are fun and easy to make using bright tissue and pipe cleaners or floral wire. Just remember to have adult supervision for little ones when employing scissors. Cheery skeletons featured in El Dia del Muerte include flower laden hair, garlands, and other such cheerful decorations. These keep skulls and bones from looking spooky but instead disarm and charm. Set or hand these around your party space. While not traditional to Day of the Dead, pinatas have Latin America poignance and may be found in skull or skeleton form. Fill these with an assortment of small sweets and toys. If you worry about the mess, purchase paper "Calacas" masks. 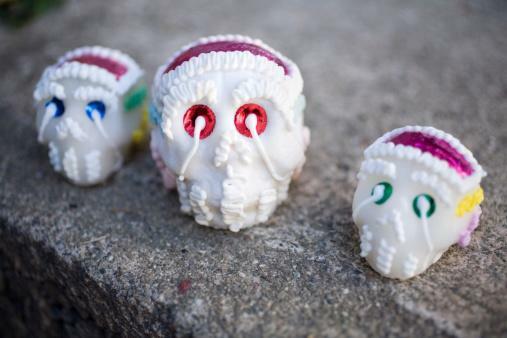 They fit around the head with string or elastic and feature brightly colored skulls. Fashion an entertaining and instructive game similar to Pin the Tail on the Donkey with a cork board, skeleton part cut outs and some pins. Young people enjoy assembling the full skeleton and learning about anatomy at the same time. Involving children in the meal preparation keeps them busy and helps the hostess provide a hands-on menu. Kids decorate hard boiled eggs, cupcakes, or cookies, with skeletal details. A white chocolate dipping station with frosting bags turns chocolate dipped strawberries into tiny skull faces. In keeping with Latin America cuisine, stay youngster friendly with mini quesadillas or smaller tamales which are easy for little hands. Shrimp with tangy sweet sauce or chicken skewers in mole sauce are enticing additions to a child themed bill of fare. Fancy tropical fruit punch or Mexican hot cocoa add the right beverage notes while dessert items such as traditional sugar skulls, Day of the Dead bread, and individual cakes round out the menu. Many of the Day of the Dead symbols create dramatic decor and flavor for a grown up event. 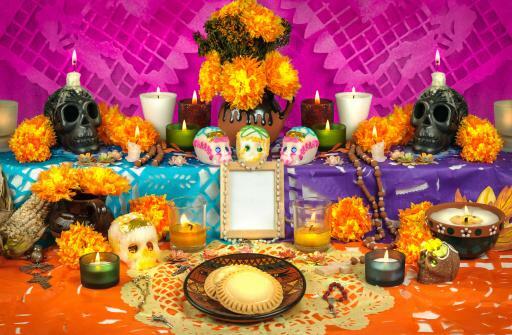 The ghoulish romance of the holiday translates into easy fiesta decor, food, and drink. Adults are encouraged to wear costumes and masks for a masquerade feel. Provide plenty of Latin music and even contract a dance instructor to get dubious dancers out onto the floor. Illumination and decor form an integral part of designing the room. Introduce the key elements of the celebration that represent water, wind, fire, and earth. Candles are fire, hanging tissue paper banners are wind, and a special bread, Pan de Muerto, stands in for earth. Decorations for Day of the Dead can also include skull wreaths and glow-in-the-dark skulls as the day turns to evening. The look of the buffet melds all the party fundamentals into a seamless fiesta. Marigolds serve as a guide for the dead as they come to celebrate. These are incorporated as centerpieces, individual place markers in tiny colorful pots, or by setting packets of marigold seeds inscribed with each guest's name. Copalli incense will give the festivity an authentic scent. It is a symbol of the transformation from a corporeal being to a spirit. Brightly colored plates and tableware dotted with sugar skull candy and decorative touches gleaned from the local Latin import store round out the table scape. Hang festive streamers, monarch butterfly wreathes or tissue paper garlands glow in candlelight, casting eerie shadows and draping the dining area in romantic drama. Encourage guests to bring a small framed photo of a lost loved one. 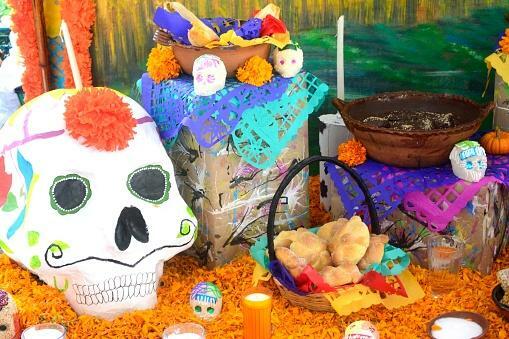 This is traditional at the ofrenda, or altar, honoring the dead. Use them on the table as a reminder of the more serious meaning behind the gathering. Alcohol has a place in Day of the Dead celebrations. Bottles of the deceased ones favorite alcohol are placed at ofrendas to attract the dead and honor them. Festive drink ideas can make the day. Tequila is a natural alcohol to serve to guests at a Latin themed event. Design a tequila bar with accompaniments, mixers, garnishes and a variety of small batch tequilas to sample. If the day is cold, make strong Mexican coffee and provide Kahlua, tequila, and whipped cream. A nutmeg grinder will add authentic zest to the drink. Alcoholic fruit punch is easy to craft and has an exotic flavor. Mix any tropical fruit juice with tequila, rum or even vodka. Place out individual bowls of cut fresh fruits as garnish. Mojitos are Cuban beverages but the flavors blend well with Day of the Dead menu items. A DIY mojito bar is a hit at any party. Ensure that there are mint leaves for muddling and plenty of limes. Homemade salsa, guacamole, and chips are a simple and budget friendly appetizer but there are is more to a meal than hors d'oeuvres. 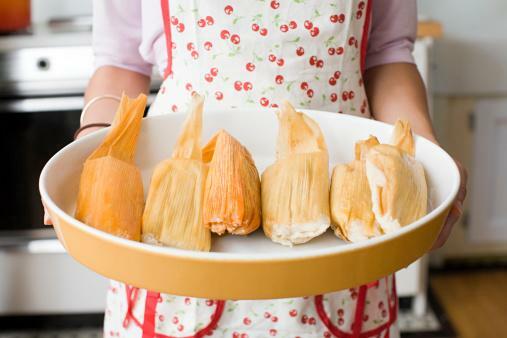 Tamales are traditional menu items at Dia De Los Muertos events. A tamale selection will appeal to any palate. Don't forget to include a vegetarian option for guests that eschew meat. Albondigas soup is a Latin meatball stew that is hearty, rich in flavor and perfect for a fall celebration. Mole dishes feature prominently in Day of the Dead menus. The savory, spicy dish has earthy notes from cinnamon, chocolate, and coffee, with some heat thrown in from roasted chiles. Use the sauce over enchiladas or serve roast chicken and rice draped in aromatic flavors. Day of the Dead bread with lightly scented anise essence is an apt accompaniment to the meal. Finish the menu with an assortment of sweet Latin cakes, cookies and chocolates. El Dia De Los Muertos has such a colorful history and rich traditions that a party designed around the observance almost festoons itself. Celebratory touches that echo the holiday's lore and key elements adds an authentic element to the event that guests will love and creates special memories as they honor the dead.